1. 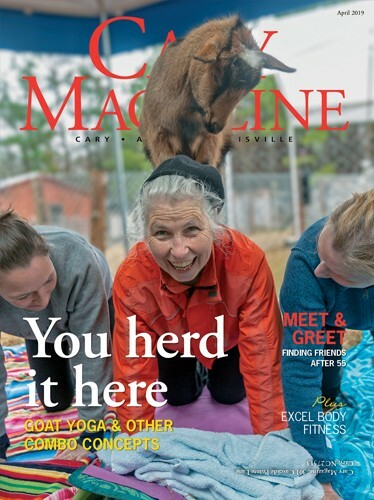 Cherokee Media Group is the publisher of Cary Magazine. 4. Any deviation from this usage policy constitutes a violation of the agreement between the user and CMG and dissolves any potential liability to CMG, and such deviation may also create a cause of action solely on behalf of CMG and its agents to prosecute in both criminal and civil matters to the full extent permitted by law. 5. CaryMagazine.com is copyrighted by CMG, under the laws of the United States. Unauthorized access of the CaryMagazine.com website as well as misuse and misrepresentation of the CaryMagazine.com and Cherokee Media Group names, will result in prosecution under Title 18 of the United States Code and any applicable state or local law. CMG waives any and all liability, attributable to CMG, associated with such unauthorized access and misrepresentation of its name by unauthorized agents. 6. DISCLAIMER: CMG MAKES EVERY EFFORT TO ENSURE THAT THE INFORMATION ON THE CARYMAGAZINE.COM WEBSITE IS ACCURATE. CMG AND ADVERTISERS APPEARING ON THE CARYMAGAZINE.COM WEBSITE ARE NOT RESPONSIBLE FOR ANY PECUNIARY LOSSES INCURRED AS A RESULT OF INACCURATE OR OUTDATED INFORMATION PROVIDED AND SET FORTH BY THE CARYMAGAZINE.COM WEBSITE. ANY MENTION OF THIRD-PARTY PRODUCTS IS FOR INFORMATIONAL PURPOSES ONLY AND CONSTITUTES NEITHER AN ENDORSEMENT NOR A RECOMMENDATION FOR SAID PRODUCTS. CMG ASSUMES NO RESPONSIBLILITY WITH REGARD TO THE PERFORMANCE, AVAILABILITY OR USE OF THESE SERVICES. FURTHERMORE, CMG MAKES NO WARRANTIES OF MERCHANTABILITY, EITHER EXPRESS OR IMPLIED, NOR ANY WARRANTIES OF FITNESS FOR A PARTICULAR PURPOSE FOR THE DATA AND PRODUCTS CONTAINED HEREIN. CMG STRONGLY SUGGESTS CONTACTING, THROUGH WRITTEN MEANS, SUCH THIRD PARTIES FOR MORE INFORMATION AND TO CONFIRM ANY INFORMATION CONTAINED WITHIN THE CARYMAGAZINE.COM WEBSITE. 7. CMG is a duly incorporated corporation of the state of North Carolina, United States of America. CaryMagazine.com is an entity of CMG. In the event of any potential litigation, the user agrees to submit to the jurisdiction of the state of North Carolina and to abide by and to be bound by the laws therein. By providing CMG with your email address, you agree to join CMG’s email list. CMG will periodically send emails with news, information and items of interest to subscribers on its email list. CMG will not rent or sell your e-mail address to a third party or its partners. You may, at any time, request that CMG remove your email address from its email list by using the “unsubscribe” link found in each email. To prevent unauthorized use of email addresses, CMG maintains physical and electronic barriers around the access to its email list database. CMG reserves the right to alter this Email Use Policy as it sees fit. Any changes to the Email Use Policy will be posted to this site and are effective immediately. If you have any questions about this Email Use Policy, contact us or call (919) 674-6020. Contest winners will be notified via email. Winners must respond within 4 calendar days unless otherwise noted. For giveaways where a phone number is required for entry, Cary Magazine will contact winners by phone on the fourth day if prize is not claimed via email. Prizes not claimed by the fifth day are forfeited. Non-winners will not be notified. Cary Magazine reserves the right to post a winner’s name on CaryMagazine.com, Cary Magazine’s Facebook page, and/or in the Cary Magazine e-newsletter. Cary Magazine does not guarantee winner names will be released. Item winners must pick up prizes at the Cherokee Media Group office, located at 301 Cascade Pointe Lane, Cary NC 27513. Gift card or ticket winners may, if the event is at least 5 business days in the future, elect to have prizes mailed, at the winner’s risk of postal loss or theft. CMG does not unknowingly collect any personal information about you during your visit to CaryMagazine.com. CMG does, however, use a Web analytics program to collect statistical data regarding your visit to help better understand how visitors use CaryMagazine.com. This Web analytics program uses a Web “cookie,” a commonly used piece of computer code used to help identify your computer during a visit to CaryMagazine.com. This cookie does not collect or transmit any personal information about you during your visit. If you do not wish for CaryMagazine.com to collect this data during your visit, you should change your browser settings to reject cookies when browsing the Internet. Rejecting cookies when visiting CaryMagazine.com will not take away from your ability to use the website.